Vampirella herself hasn't got much of a reputation as a singer/musician, nor has there been an official album of Drakulonian Folk Songs ... however, some people have used Vampirella (or her image, anyway) on their records and/or CDs. The Misfits have used her to a certain extent as part of their Horror/Punk genre, but Vampirella has also popped up on some interesting songs/albums. Keep an eye on this section, it is due to expand drastically in the near future. My research into Vampirella related music is ongoing and turning up some unusual finds! This was described on eBay as "a Rare Original KBD Punk Rock 12" record Album. 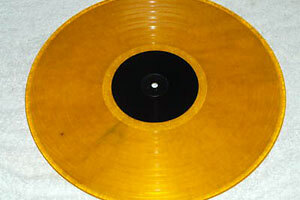 This is; THE MISFITS "Live Vampirella" ltd. ed #235 of 500 w/POSTER, YELLOW wax rare Live record." 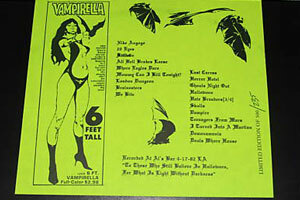 One of the tracks is called Vampira, and they have used a copy of the Warren magazines' advert for the 6 foot Gonzalez poster on the sleeve. 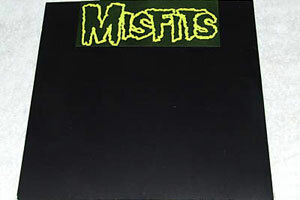 Trawling through the various Misfits' web sites and checking out their discography I cannot find this particular item listed anywhere! Maybe it's a bootleg. If you know about this record, please share! 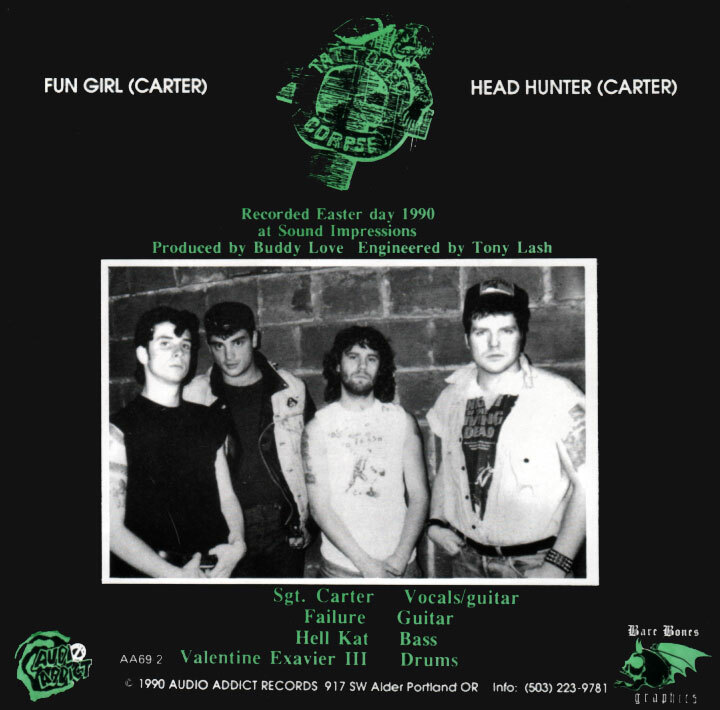 This is a 7" transparent green vinyl single record of "Fun Girl" (the B side has the track "Headhunter") which has a pretty obvious picture of Vampirella on the cover, though the bat logo on her lower abdomen has been erased. Formed in 1989, Tattooed Corpse hail from Portland, Oregan and have yet to attain international fame. If you feel obliged to listen to the Fun Girl track try their MySpace page, though it may not be worth the visit unless you are a die hard punk rock fanatic. Sorry, guys. Love the cover, but your punk doesn't rock my boat.